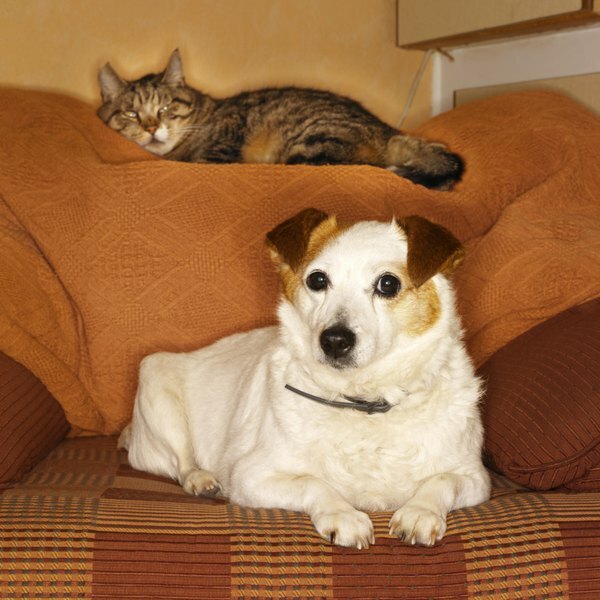 How Long Have Dogs & Cats Been Domesticated? Dogs and cats have been our companions for thousands of years. An estimated 30 percent of American households have at least one cat. About 40 percent have at least one dog. But how long have they been among us? Turns out that dogs and cats have been in the lives and homes of our ancestors for thousands of years. Cats were first domesticated in the Near East about 10,000 years ago. The modern domestic cat is descended from a wild ancestor called Felis silvestris lybica. All 600 million housecats in the world can be traced back to five females of this species. They lived in forests before they moved into villages. Ancient Egyptians worshipped a cat goddess and had their beloved pets mummified and buried with them, along with mummified mice. Cats are unique in that they are the only animals known to have domesticated themselves. When humans stopped following herds and began to farm, grains were staple crops. Harvested grains attracted rodents, which in turn attracted cats. Humans observed and appreciated the rodent control. They, in turn, allowed cats to stay, and they protected and fed them. Dogs are thought to be the first animals to be domesticated. They have been our companions for 10,000 years -- probably just a little bit longer, in the historical scheme of things, than cats. Some scientists believe that the ancestor of all dogs, both wild and domesticated, is the small South Asian wolf. Dogs were domesticated by the lure of an easy meal. While humans were still hunter-gatherers following herds, canine ancestors were drawn to their camps by the smell of food and followed to scavenge leftovers. When humans realized they would bark when predators were near, they began to feed them willingly. Dogs have loyally followed and protected us ever since. What Is the Likelihood of Puppies Looking Like Their Parents?